CDM World Tour: catch up with Mike and Liz in Chicago, and Peter and Jaymis in Perth and Brisbane (Australia)! 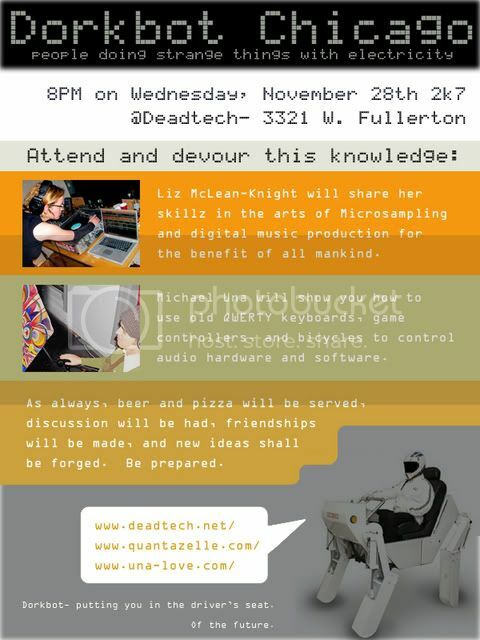 Any CDM-ers in the Chicagoland area are most warmly invited to this months Dorkbot at Deadtech, 3321 W. Fullerton Ave., on Wednesday at 8pm for food, drink, and brain-swelling information regarding micro-sampling and alternative musical controllers like QWERTY keyboards, game joysticks, and bicycles. This week’s presenters will be Liz McLean-Knight and Michael Una, contributors to CDM. Australia is CDM’s second home, land of crazy creative contributors and designers, and birthplace of the CDM logo and graphic identity. And now I get to go there. Okay, odds are, you aren’t anywhere near Perth, as it’s supposedly the most isolated city on the face of the Earth. But on the off chance that you are in/near Perth, you’ll definitely want to come out for this one. Visualists like Artificial Eyes and Jean Poole, not to mention festival organizers VJZoo, join a convergence of visual artists from game development to experimental film and motion graphics and special effects. I’m on a panel Wednesday night, but mostly Jaymis and I will be hanging around covering the festival and chatting with cool people. And we get to see whether our first in-person meetup creates a geek matter-antimatter temporal singularity.